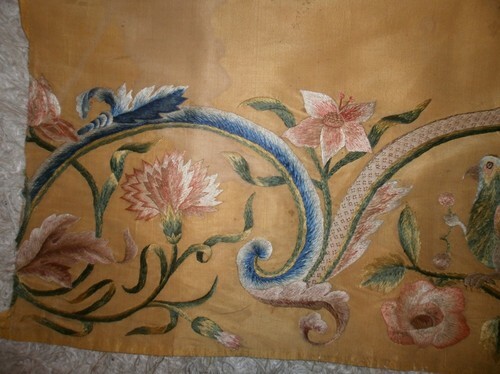 A VERY BEAUTIFUL ITALIAN SILK PANEL WITH EMBROIDERED FLORAL DESIGN AND PAROTTS. COLOURS STILL VERY GOOD BUT THE OTHERSIDE SHOWS HOW VIBRANT THEY WERE . ON A GOLDEN SILK . CENTRAL JOIN , SOME MARKS ON THE PLAIN SILK DUE TO AGE . 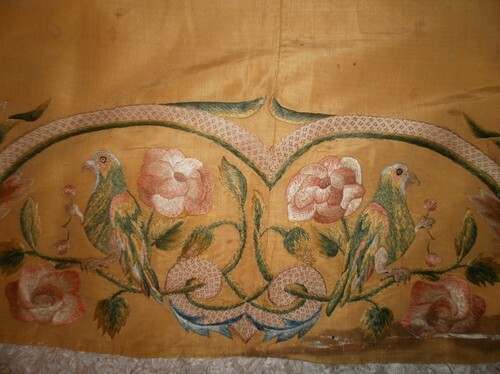 EMBROIDERY IN EXCELLENT CONDITION . THE BOTTON EDGE HAS SOME SERIOUS DETERIORATION AS SHOWN IN THE PHOTOGRAPH AND THIS SECTION IS VERY DELICATE IT LOOKS AS IF IT HAS BEEN GLUED HERE AT SOME POINT IN ITS LIFE . 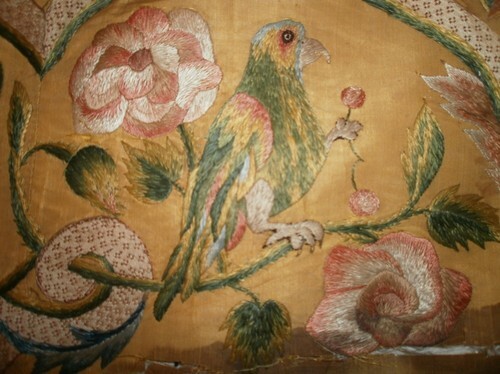 HOWEVER IT IT AN ANTIQUE TEXTILE OF ABOUT 1650 IF NOT EARLIER. STILL IN FAIR CONDITION AND WOULD LOOK WONDERFUL FRAMED . MEASURES 46 INCHES IN LENGTH BY16 INCHES IN WIDTH. I'm not sure about that 1650 date - I'd put it later- but it does look to be from somewhere around the 17th Century mark. My guess is this was either part of an alter covering or a hem to a skirt.